EFT, or Emotional Freedom Techniques, is often referred to as “acupuncture without the needles.” And it is not altogether a bad description. Just like acupuncture, EFT is based on the meridian system on which Traditional Chinese Medicine is built. But unlike acupuncture, EFT is focusing on eliminating electric disruptions in the same meridian system in relation to a specific negative emotion/sensation/memory. And of course, it uses gentle tapping instead of needles to do so. By tuning into the specific emotional problem (or the emotional cause of a physical problem) while tapping on a meridian ending/beginning point, Roger Callahan (founder of Thought Field Therapy and forefather of EFT) discovered that phobias could be cured in minutes. He developed specific protocols to address a wide variety of issues. Gary Craig built on his work, developing an easy-to-use protocol, and applying EFT to an even wider variety of issues and conditions. And it’s been known to remove the emotional and energetic blocks toward health in many physical issues, helping the body return to health and balance, even – or especially – when nothing else has worked. And tap, tap, tap as often as you can! *Please note: EFT is a very flexible improvement tool that can be used for just about everything. The original version and complete training can be found at emofree.com and eftuniverse.com. 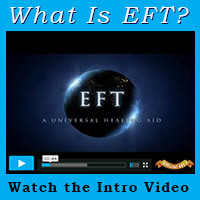 More about the fascinating power of EFT in my free e-book and in the FAQ section.